I am the first to admit that PATIENCE has never been one of my strengths. I don't think anyone who knows me would ever describe me as a patient person. Passionate, yes, patient, not so much. As someone who is immersed in creativity for a living, I often find myself super excited about the prospects of new ideas and projects, instantly thinking about the end result, most often mentally skipping over the entire middle portion of the actual DOING. This used to stop me in my tracks... the part of the process that required time, planning and PATIENCE alluded and too often even paralyzed me. Patience is not merely the ability to wait, but the ability to wait with a good attitude (or as I say to my kids "patience is waiting nicely"). Working with plants has taught me about the beauty and purposefulness that can be found within those moments of waiting. Take for example SUCCULENT PROPAGATION. Whether you are propagating through clippings (where you clip part of a plant and then replant it, waiting weeks for roots to reemerge) or growing baby plants via succulent leaves (in which you wait for months for tiny succulents to grow from leaves) PATIENCE will be a key ingredient in your success. When propagating a succulent clipping, it's best to wait about 24 hours from time of clipping it to time of planting it. This gives the cut end a time to callus up leaving the plant less exposed to damage from root rot or possible infections. In addition, after planting your clipped succulents, you should wait at least one week prior to giving it a nice drink of water. This gives the clipping time to start growing some new roots, also minimizing potential for damage. The simple act of waiting to water after creating something new has actually taught me a lot about my own approach to patience. I used to feel compelled to share every idea as soon as I had, and every art piece as soon as I created it. As soon as I had an idea I would immediately contemplate how it would end and would want to share it far and wide. Too often this impatience with my own thoughts would lead to my ideas and motivation just fizzling out. Yet observing my plants, and their at times slow approach to growth, has taught me the value of holding my ideas and my art close. Of not feeling the need to share right away, but giving these ideas rooms to grow, develop and fully realize their potential. At times, getting quiet and still within my patient places is still a struggle for me. I still have many moments when my brain tends to inflate my perceived failures and “lack ofs”, while deflating my achievements and slow yet steady growth. Thankfully I am getting better at recognizing and altering these negative self talk tendencies. Cultivating patience is something I am continuing to practice, and I am happy to report that I have recently added daily meditations and lots more writing into my life. This is truly helping me to be still with my thoughts and patient with myself and everyone else around me too! I credit working with my plants as the motivation behind my desire to embrace those moments of waiting, of being still and reflective and to avoid inundating myself or my ideas with all the things immediately. There is so much to be learned in those places of patience, in incubating those ideas until they are truly ready to be watered cared for, grown and shared. RACHAEL COHEN is the creator & owner of INFINITE SUCCULENT, a plant art styling and educational service in San Diego, Ca. 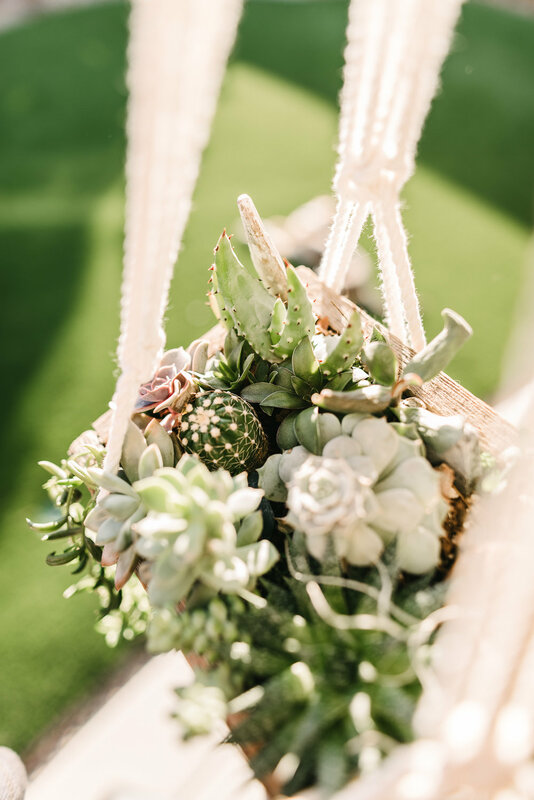 Through her plant art and styling services, as well as her workshops, Rachael connects and engages her clients with the natural world, while helping them achieve the botanical atmosphere of their dreams!